While Manhattan and San Francisco are known for their notoriously inaccessible real estate markets, it’s Vancouver that takes the title of North America’s most unaffordable housing market, according to Point2 Homes’ recent study. The study was conducted to figure out how long it would take for people to pay off their homes in 50 of the most populous real estate markets in the United States, Canada, and Mexico. By dividing the median home sale price by the median annual family income in each market, a “median multiple” was calculated, which expresses the number of years required to pay off a home. 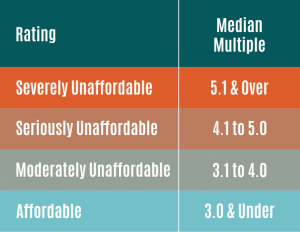 Communities with higher median multiples have wider affordability gaps. This results in more years required to pay off a home. The study used U.S. dollars when discussing monetary amounts. The Vancouver real estate market, therefore, is severely unaffordable, with its median multiple of 17.3. This rating was calculated using the city’s median home sale price of $1,108,345 and median family income of $63,944. Manhattan’s median family income of $77,559 and median home sale price of $1,207,500 gives the borough a median multiple of 15.6, making it the second most unaffordable market in North America. Coming in at third most unaffordable market is San Francisco, with a median multiple of 13.8, based on a median family income of $92,094 and median home sale price of $1,275,000. It might be surprising that Vancouver would take first place in such a list, based on Manhattan’s and San Francisco’s higher median home prices, but Vancouver’s much lower median family income creates a large enough affordability gap that its rating surpasses those of the other two communities. Besides Manhattan and San Francisco, a number of other U.S. markets placed high on the unaffordability list, including Brooklyn (13.1) and Los Angeles (12.1). A few Canadian cities weren’t too far behind, with Toronto at 7.5, Mississauga at 7.4, and Montreal at 4.2. While these other Canadian cities are considered severely or seriously unaffordable, they are nowhere near Vancouver’s level. A good example is the second most unaffordable Canadian market, Toronto. With a median home sale price of $471,600 and a median income of $62,624, the city has an affordability ratio of 7.5. This means a homeowner in Toronto could pay off their home in 10 fewer years than a homeowner in Vancouver could. Unaffordable housing markets appear to be a widespread issue, with 32 of the 50 markets in the study ranked as seriously or severely unaffordable. First-time homebuyers, as well as professionals who should be able to afford real estate, are often forced away from homeownership due to such unaffordability. Detroit, the most affordable real estate market in both the U.S. and North America overall, provides a small glimmer of hope, with an affordability rating of 1.8. Winnipeg is home to Canada’s most affordable real estate market, with a median multiple of 3.4, and Monterrey’s 2.7 median multiple ranks it as Mexico’s most affordable market. Out of the three North American countries included in the study, Canada has the most unaffordable real estate market. Its severely unaffordable median multiple of 7.5 was calculated using the annual median family income of $64,752 and median home price of $485,680. In second place, the United States’ median multiple of 4.6 means its housing market is seriously unaffordable. The country has an annual median family income of $56,516 and median home price of $258,300. With a median multiple of 3.3, third-place-ranked Mexico’s housing market is described as moderately unaffordable, based on an annual median family income of $12,806 and median home price of $41,748.